Magh Sud 5 (5th day of the bright fortnight of the lunar month of Magh) is the day of Vasant Panchami. Hindus all over the world celebrate this festival with great enthusiasm. 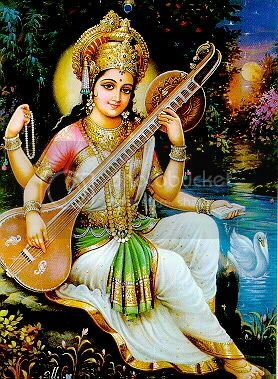 This Panchami is also known as Saraswati Day. It is believed that this day is Saraswati’s birthday. Hindu temples are full of activities on this day. Some people feed Brahmanas on this day. Pitri-Tarpan (ancestor worship) is done on this day. The god of love (Kamdev) is also worshipped on this day. Children are taught their first words on this day (as an auspicious beginning to learning). Schools, colleges etc., (places of learning) organise special worship of Saraswati. Pandit Madan Mohan Malviya laid the foundations of Kashi Hindu Vishwa Vidyalaya on Vasant Panchami. This has become a world famous top class academic institution. Hinduism has taken into account special significance of seasons and interwoven that with religious festivals e.g., Makar Sakranti, Vasant Panchami. People generally feel inclined to worship the presiding deity of the family (Ishta Devata or Devi) according to the individual’s faith and desires. Also, people generally tend to accumulate wealth and power. During the Kali Yuga (present age), the pursuit of money (wealth, power, name and fame) is everything to most people. Money is accorded god-like status. But men of principle (men who can discriminate) worship goddess Saraswati for spiritual enlightenment. In their opinion, there can be no comparison between the king and the learned (spiritually advanced). The king is honoured within his kingdom, whereas the learned is respected (or worshipped) everywhere. Saintly people and people inclined towards spiritual progress attach great importance to the worship of goddess Saraswati. The vehicle assigned to each of the three goddesses also symbolically represent their special powers. The white swan of Saraswati is symbolising Sattwa Guna (purity and discrimination). The owl of Lakshmi and the lion or tiger of Durga symbolise the other two gunas (Rajas and Tamas). The first faint signals of the forthcoming festival of Holi manifest at Vasant Panchami. Seasons undergo change. The coming of springtime is heralded. Trees are displaying new shoots. New life is evident in the woods and fields. Nature decorates Mango trees with new blossoms. Wheat and other crops enliven with evidence of new life. Vasant Panchami is a festival full of religious, seasonal and social significance and is celebrated by Hindus all over the world with verve and new sense of optimism. Vasant means, "the spring season". This is the great spring festival, falling on the fifth day of the month of Magh, the first day of spring. On this day everyone wears a yellow cloth. It represents the ripening of the spring crops. Even the food is coloured yellow by using saffron. Spiritually, the yellow colour is a sign of prosperity; it is the colour of love. On this day we offer special worship to the sun god, to Mother Ganga (the deity of the sacred river Ganges), and Mother Earth. They provide us the means of acquiring food and all that we need to keep alive. We express our gratitude to them by worshipping them. Hindus are ever mindful of the debt they owe to all nature. Worship of nature is extremely important to them. Join madrasa, why sit for tough CBSE board exam? ONE PARAGRAPH THAT EXPLAINS LIFE! Qualities of a good friend? Teach Him Gently...If You Can..
LETTER TO CHANNEL 4 TV (UK), January 6, 2009. You Are All God: Swami Vivekananda.